Each district of Tenochtitlán was composed of neighborhood wards of land-owning families called calpulli, an Aztec term meaning simply "house groups". Most of the calpulli were inhabited by farmers who cultivated bountiful crops of corn, beans, and squash with an ingenious system of raised fields called chinampas, while others were occupied by skilled crafts people. 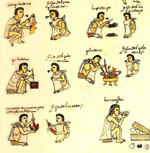 Codex Mendoza features a remarkable series of illustrations that idealize the Aztec life cycle. Folio 57r illustrates a mother addressing her child set into a cradle. After four days marked by colored rosettes, an elderly midwife prepares the baby for a ritual bath and naming ceremony. Symbols invoked for a boy consist of arrows and craftspersons' tools. Symbols invoked for a girl are a broom, a spindle, and a basket. Three boys appearing to the right call out the infant's name. Click on Image for more detail. Folio 57v shows children at ages three, four, five and six engaged in serving their families with chores. A father directs his five year old boys to carry loads of wood or transport goods to the market place. A mother shows her daughter how to hold the spindle whorl, the first step in the instruction of weavers. The ration for children this age is one tortilla. Click on Image for more detail. Folio 58v depicts punishments given to children who disobeyed their parents. Ten year old children were beaten with sticks for example. Click on Image for more detail. Folio 59v shows the chores children were expected to perform as teenagers; tasks such as harvesting bull rushes, grinding maize, fishing and weaving. Click on Image for more detail. Folio 61v illustrates the occupations that youths were expected to fulfill. Military service was obligatory. Youths learned to fight by accompanying veteran warriors on campaigns and serving as porters for the supplies that they would both need to survive on the march. Click on Image for more detail. Folio 69v shows the various trades and crafts that young men might practice including: carpenter, painter, featherworker, lapidary, and metalworker. Click on Image for more detail. Folio 61r depicts ceremonies related to marriage. After the arrangements are discussed by the parents, the bride is brought to the groom's house at night. The couple then sit on a woven grass mat and their garments are tied together to symbolize the union. Elders give advice and admonishments of their respective obligations to one another. Click on Image for more detail. Folio 70v shows that punishments for public intoxication, theft, adultery and other social deviances were severe and usually entailed stoning. Click on Image for more detail. Folio 70v. 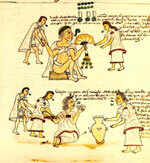 Ordinarily intoxication was prohibited in Aztec society, but once a man or woman had reached the age of seventy, they were entitled to imbibe at their leisure, after a life of self-less toil. Click on Image for more detail. 1992 The Codex Mendoza. Four volumes. Berkeley: University of California Press.